The localized varicosities of the hands and digits are quite rare with only a handful of cases reported in the literature. The cause of upper and lower limb varicosities are almost the same and the same treatment principles should be followed for both. Here, we report a case of 19-year-old male with localized varicosities of the dorsum of his hand and digits. Diagnosis was confirmed by color Doppler ultrasound scanning. He was managed by multiple ligations and excision of varicose veins with excellent results. Varicose veins of the upper limb are very rare as compared to those of the lower limbs. The patients who use to lift weights, those with congenital disorders like Klippel Trenaunay syndrome and those with arterio-venous fistulae for hemodialysis are at high risk for development of upper limb varicosities. The treatment options for upper limb varicose veins remain the same as those for the lower limb varicosities, i.e., ligation and stripping  and even sclerotherapy in selected cases. We report a rare case of varicose veins in the dorsum of hand and digit in a 19-year-old otherwise healthy male. 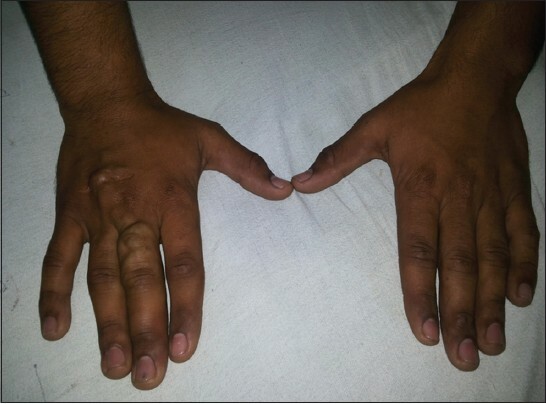 A 19-year-old male presented to our clinic with a chief complaint of multiple soft swellings over the dorsum of the right hand and over the middle and ring fingers. The swellings were absent at birth, but they gradually arose at the age of 5 years and progressively increased in size since then. They were neither associated with pain, nor was there any history of antecedent trauma to the same area. There was no history of presence of similar swellings in the left hand or in both lower limbs. There was no significant family history of varicose veins. On examination, there were multiple swellings with tortuous appearance and of approximate size of 2 × 1.5 cm over the dorsum of the right hand and right middle finger [Figure 1]. Both upper limbs were equal in size. 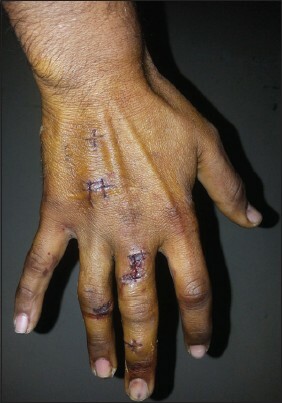 The dorsum of the right hand showed a transverse scar because of previous surgery about which no record was available. There were no hemangiomas on the surrounding skin and the limb above the swelling showed no varicosities. Swellings disappeared on raising the arm above the head. On palpation, the swellings were soft and compressible. Bilateral pulses were equal in rate and volume and no bruit was audible on auscultation. The color Doppler scanning of the right arm and the hand was done which demonstrated multiple vascular channels over the dorsum of the right hand, middle finger and lateral aspect of the ring finger. The venous flow was detected in all the vessels and no arterio-venous shunts were seen. The arterial circulation was found to be normal. 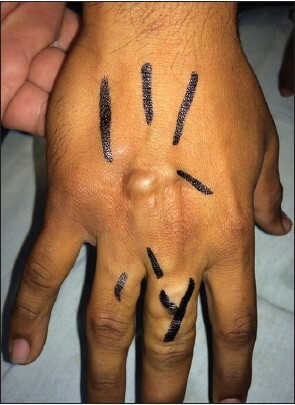 After taking a written informed consent from the patient, the sites of varices over the dorsum of hand and digits were marked preoperatively [Figure 2]. The patient underwent multiple ligations and excision of the tortuous veins under general anesthesia. The post-operative course was uneventful. Follow-up at 1 month and again at 2 months showed no recurrence and the patient were well satisfied with the surgical outcome [Figure 3]. The rarity of this pathology was discussed with the patient and written consent was taken from the patient for reporting of his case and pictures for publication. The secondary varicose veins occur due to venous outflow obstruction caused by deep vein thrombosis or arterio-venous fistulae. Among congenital vascular anomalies, congenital arterio-venous fistulae,  Klippel-Trenaunay syndrome  and Parkes Weber syndrome More Details  are rare causes of arm varicose veins. On review of literature, few reports of localized varicosities were found which were more so on the dorsal aspect of hand and digits. Some surgeons preferred sclerotherapy followed by compression, which yielded good results. However, sclerotherapy requires higher concentrations of sclerosing agents to prevent failure, thereby causing minor side-effects in the majority of the treated patients. The low failure rate of excisions was shown recently by other authors. , In our case also multiple ligations and excision of varicosities showed excellent results without any side effect or recurrences. The localized varicose veins of hand and digits are extremely rare pathology, but they are amenable to prompt diagnosis and successful treatment by multiple ligations and excision of varicosities and by sclerotherapy. 1. Clark DM, Warren R. Idiopathic varicose veins of the upper extremity. N Engl J Med 1954;250:408-12. 2. Welch HJ, Villavicencio JL. Primary varicose veins of the upper extremity: A report of three cases. J Vasc Surg 1994;20:839-43. 3. Jain S, Jain P, Singh T, Aggarwal N, Singh A. Primary varicose veins of the upper extremity: A case report. Indian J Surg 2004;66:169-71. 4. Duffy DM, Garcia C, Clark RE. The role of sclerotherapy in abnormal varicose hand veins. Plast Reconstr Surg 1999;104:1474-9. 5. Donogue GO, Leahy A. Varicose veins. Surgery 2002;1:8-11. 6. Rose SS, Ahmed A. Some thoughts on the aetiology of varicose veins. J Cardiovasc Surg (Torino) 1986;27:534-43. 7. Girón-Vallejo O, López-Gutiérrez JC, Fernández-Pineda I. Diagnosis and treatment of Parkes Weber syndrome: A review of 10 consecutive patients. Ann Vasc Surg 2013;27:820-5. 8. Sreekar H, Dawre S, Petkar KS, Shetty RB, Lamba S, Naik S, et al. Diverse manifestations and management options in Klippel-Trenaunay syndrome: A single centre 10-year experience. J Plast Surg Hand Surg 2013;47:303-7. 9. Davis RP, Lipsig LJ, Connolly MM, Flinn WR. Varicose ulcer of the upper extremity. Surgery 1985;98:616-8. 10. Kawakatsu M, Fujiwara M. Venous varix on the dorsal aspect of the thumb: Report of two cases. Hand Surg 2013;18:261-5. 11. Kawakatsu M, Fujiwara M, Iwasaki K, Sumiya A. A case of venous varix of the volar digit and review of the literature. Hand Surg 2009;14:53-6.